While it should come as no surprise, security and growing regulatory burdens are the top concerns for healthcare CIO’s. Ransomware, denial of service, and data theft attacks are in the headlines every day. The estimated annual cost of ransomware payments in 2016 was over one billion dollars. In fact, the number of ransomware attacks in 2016 was up by more than 4 times.¹ PHI security, data breaches, and data theft remain critical issues. Cybercriminals have learned to follow the path of least resistance. Rather than trying to penetrate network security fortifications, they seek access to systems through the compromise of valid user accounts. Stealing credentials and using them to access a network is easier, less risky, and ultimately more productive than exploiting a perimeter vulnerability. About 12% went on to click the malicious attachment or link and thus enabled the attack to succeed. Given these numbers, it’s no surprise that emails are the number one contributor to data breaches. 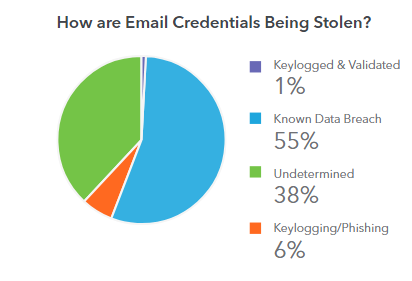 In fact, 63% of breaches in the US are the result of a compromised email credential. While no industry is safe, the threat to the healthcare industry is equally astonishing and growing. Based on findings in the Ponemon Institute’s 2016 Study on Privacy and Security in Healthcare, 90% of healthcare organizations have had a data breach in the past two years. The study estimates that the resulting cost of these breaches to the U.S. Healthcare industry alone is $6.2 billion. Historically, organizations have been unable to see the swirling pool of potential email attacks and to detect specific vulnerabilities until it’s too late. Only after a breach do they find malicious code on a laptop or identify the need for user training. But the battle for corporate email information is taking place in plain sight every day for those that navigate the Dark Web. This is the playground where stolen email credentials – typically including user’s corporate email address and passwords — are being openly shared and sold among the multitude of “customers” in the hacking community. This paper explains the pervasive nature of email compromises and sheds light on the quantity, variety, sources, and consistent growth of these threats. The study results are eye-opening. Overall, 68% of all analyzed covered entities and their business associates have employees with visibly compromised accounts — 76% of which include actionable password information. 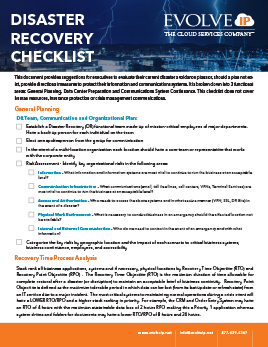 The survey findings illustrate the need for 100% reliable and responsive business continuity solutions and rapid-response disaster recovery. How your reactive protection is set up makes the difference between a minor glitch and a major catastrophe. • Healthcare firms are under attack — new data published to the Dark Web every day provides a window into the volume of new email and passwords that criminals have accessed. • There is a constant need to monitor for vulnerabilities and train personnel regarding email best practices. • Ransomware is a billion dollar program and growing. 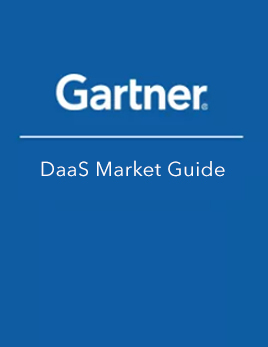 • Gaps in security have allowed phishing attacks to become more effective. 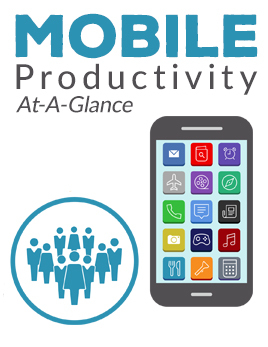 • As the volume and quality of data elevate, malicious efforts are experiencing increased success. Overall, 68% of all analyzed covered entities and their business associates have employees with visibly compromised accounts— 76% of which include actionable password information. The Deep Web is a portion of the Internet that is hidden from conventional search engines and the general public. Search engines like Google, BING and Yahoo only search the surface web, also known as the World Wide Web (www). It’s estimated that the Deep Web is 400 to 550 times larger than the surface web and it is generally used by organizations such as universities to archive research and things of that nature. Within the Deep Web there is a portion called the Dark Web. These are enclaves, sites, and forums within the Deep Web where users can operate anonymously to avoid law detection. This is the part of the web that ID Agent analyzed for the benchmark survey. 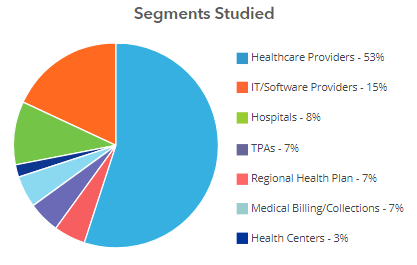 Using ID Agent’s proprietary Dark Web ID analysis technology, ID Agent and Evolve IP analyzed 1,000 healthcare companies representing a variety of business types and sizes. 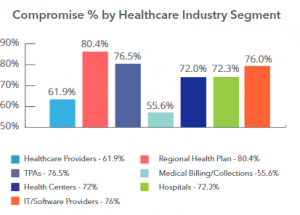 The industry segments targeted included both HIPAA covered entities as well as many business associates who provide services to the covered entities. How do criminals use stolen credentials? On average, more than 68% of the firms reviewed have compromised email credentials visible and available on the Dark Web. The numbers range from 55.6% to 80.4% depending on industry segment. The results show it is incredibly common for compromised email and password combinations to be out on the Dark Web. Even organizations with one compromise still face huge risks and the risk is proportional to company size. One organization in the study had over 300 compromised credentials. Even if the password has been changed, password patterns and human tendencies make brute force attacks and social engineering significantly easier with this information. 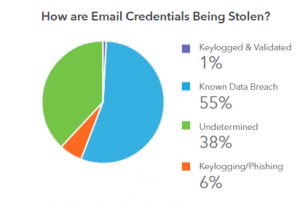 76% of the stolen email records we reviewed on the Dark Web had an associated password. Of this 76%, 23% had fully visible text passwords. In many cases, these passwords are outdated, but that does not limit their value. More than three-quarters of people use the same or similar passwords across all of their online activities. By understanding the types of changes people make to their passwords over time, hackers can create a user profile and determine a person’s new password fairly accurately by using simple guessing or sophisticated automated algorithms. 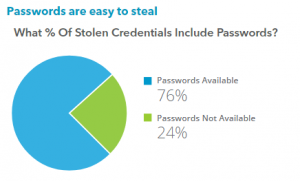 The remaining 77% were cryptographically hashed passwords. Simply hashing the password does not meet today’s needs for security. Hackers can easily use a variety of methods (many of which are available online) to crack hashes, including dictionary attacks, brute force attacks, lookup tables, reverse lookup tables and rainbow tables. This is why strong, unique passwords are paramount for each account and why passwords should change over time. What type of compromise exposed the user credentials? The study aimed to dig deeper than just how many names were compromised per organization. ID Agent’s analysis evaluated where the data originated and from where it was stolen. There are numerous points of attack, each raising a unique degree of concern. The majority of the data (55%) is the result of known data breaches where user credentials were stolen in bulk (often in widely publicized events) and then published by the perpetrators. However, the most concerning finding is the relatively small segment of email credentials (6%) directly related to phishing or keylogging attacks. While the percentage is in single digits, keep in mind that this represents over 450 individual incidents where companies in our study had exposures, any one of which could lead to ransomware, denial of service attacks, or PHI breaches. 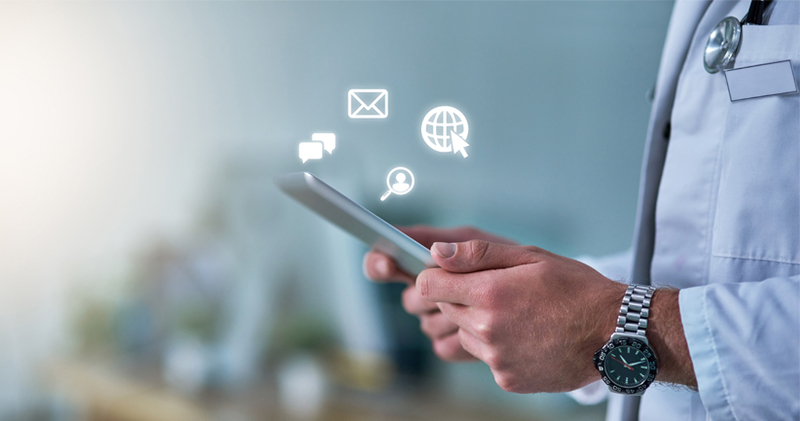 Email vulnerability is a significant contributor to the tremendous range of threat vectors that are confronting healthcare organizations. The rest of this paper will look at security best practices that help organizations avoid costly email-related breaches and also help establish a systematic and structured security posture that is consistent with world-class enterprises. The objective is to identify and control—not just to observe—the technical threats and vulnerabilities by understanding and limiting the volume of viable environmental threats. The ability to see vulnerabilities is critical for identifying hidden Dark Web threats before criminals exploit them. ID Agent provides this visibility on a regular basis and allows real-time response to urgent keylogging and phishing related compromises. With ID Agent’s information, you can understand when malware removal, forced password changes, or training of employees may be required. This data also allows firms to understand user activity and behavior over time which helps compliance teams see whether their efforts are making an impact. Are you seeing fewer credentials on the Dark Web? Is there rapid growth in activity? Proactive vulnerability reports highlight the answers. These characteristics and capabilities are consistent with a solid security foundation. However, while establishing such an environment empowers healthcare organizations to stay ahead of many emerging threat vectors, there is no known way to eliminate the potential of an attack. By following this advice, and arming your organization with the right backups, you can prevent the attackers from taking away access to your systems. The key to maintaining control is to fortify your critical infrastructure and data with regular, isolated, and recoverable backups. 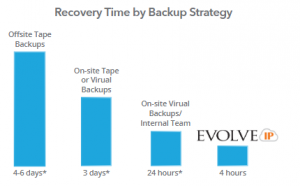 Many organizations are unaware that with Evolve IP’s technology, preparation, and expertise, almost any production environment can be restored and operational within four hours. With a range of business restoration options, Evolve IP puts you in control — not the attacker. Creating a reliable backup process. Create rapid, frequent system backups in a secure, offsite location. Ensuring data recoverability. Backups can also be infected by the malware virus if not detected immediately after infection. Evolve IP makes rapid, frequent backups of your systems, and then moves them securely offsite to an isolated location. Depending on your existing infrastructure, simple backups can be established in a matter of hours, with your data securely maintained in an isolated, private, HIPAA-compliant environment. 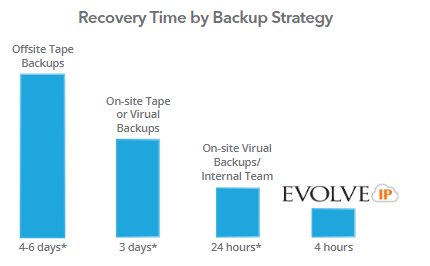 With Managed Disaster Recovery as a Service (DRaaS), Evolve IP’s team stands ready to recover any compromised customer data with a 4-hour or less guaranteed service level. The benchmark study revealed the alarming depth and breadth of an underlying and growing security threat to healthcare organizations. However, most organizations do not have the time or the resources to stay properly protected. Another solution is needed, and there is a fairly simple one. Increasingly, healthcare providers are recognizing the value of cloud-based technologies and managed services. This kind of cloud, that is strengthened by in-depth security policies and procedures and designed to meet the rigorous HITRUST CSF certification standard, goes beyond subjective standards such as SOC II and provides firms with an absolute definition of what it means to have great security. This robust hosting backbone is then combined with actively managed security services that can rapidly respond to daily monitoring requirements, security updates, emerging threats, and compliance changes. This unique combination of technology and service liberates organizations to allocate their IT energies towards key growth and business development strategies. ID Agent provides a comprehensive set of threat intelligence and identity monitoring solutions to private and public sector organizations and to millions of individuals impacted by cyber incidents. From monitoring your organization’s domain for compromised credentials to deploying identity and credit management programs in order to protect your employees and the customers you serve – we have you covered. The largest private and public sector organizations globally rely on Dark Web ID to provide actionable stolen credential data to make informed decisions. Dark Web ID combines human intelligence with sophisticated Dark Web intelligence and search capabilities to identify, analyze and proactively monitor your organization’s compromised or stolen employee and customer data.